Until April 2006 I did most of my UW photography with a Canon G5 P&S camera that was housed in a Umie DCH-701 housing. 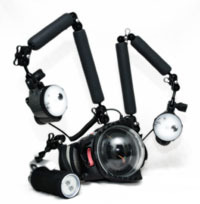 Two optically triggered Inon D180 strobes on flexible strobe-arms were used with this set. For Macro- and Wide Angle Photography I used Inon wet-lenses. Few of the pictures on this website were taken with this set. In spring 2006 I started doing UW photography with a Digital Single Lens Reflex camera. I bought a Nikon D200 with a Hugyfot DSLR housing equipped with a rotatable and magnifying 45◦ or 180◦ viewfinder. Untill today i still use this camera set and I will continue to use it untill the Nikon D400 will be available. For macro and fish photography I use a Nikon 60 mm f/2.8G ED AF-S or a Nikon 105 mm f/2.8G AF-S VR Micro lens. Both lenses can be combined with a Nikon 5T or 6T close-up lens behind a flatport to reduce its closest focusing range and increase the reproduction ratio. But nowadays I prefer to use a Reefnet Subsee +5 or +10 wet diopter, which can be used on a 67 mm threated Nauticam flatport. For Wide Angle photography I mainly use the Tokina 10-17 mm f/3.5-4.5 Fisheye Zoom lens and rarely the Nikon 10-24 mm f/4.0-5.6 rectilinear wide angle zoom lens. The Fisheye lens is used behind a Nauticam 4.33" acrylic mini dome port or a Nauticam 8.5" large fisheye dome port and the rectilinear Wide Angle lens is used in a regular Hugyfot domeport. All Nauticam ports are fitted to my Hugyfot housing with a custom made adaptor by colleague UW-photographer Cor Kuyvenhoven. For allround work I use a Sigma 17-70 mm F/2.8-4.5 DC Macro lens without HSM and OS, which is combined with the regular Hugyfot domeport. For lighting i use two electrical hard-wired Inon Z-240 strobes which are attached to my housing with Inon Float arms and Nauticam clamps of several types and sizes. The D200’s iTTL strobe-signal is converted to a Nikonos signal by a Heinrichs-Weinkamp iTTL converter which is built in the Hugyfot housing. For focussing and diving in low light conditions I use a BigBlue AFO Focus light or a set of two Inon LE250 Multi purpose LED lights.